In 2014 while coaching the USF Team at the National Collegiate Championships I found myself in amazement on top of a hill at The Hippodrome, surveying the "field of dreams". Every university was wearing uniforms, representing their college colors from across the nation, it was easy to recognize which teams they were from my panoramic vantage point. For as many years that I have toured, I get goose bumps every time I think of that moment. One I will never forget! In 1989 Ken Climo and I came to our first world championships in Iowa and won doubles, beating John Ahart and Steve Valencia. Kenny and I backed it up in 1990 in Arizona winning doubles again. Those two victories put us on the radar for good!!! 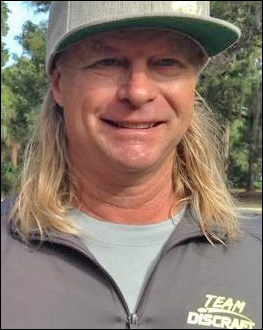 My first PDGA victory over Ken Climo and John Andrews came in 1992 at PGA National Park in West Palm Beach Gardens, Florida. If you want to be a good putter, you're going to need balance. It all starts with proper footing and a proper 'base'. Regardless if a player throws straddle, open stance or turbo, one's base (stance) needs to be balanced, enabling the thrower an opportunity to rock back and follow through without falling down or swaying from one side to another. My sidearm throw is considerably different from most players. I start with a conventional grip with two fingers on the rim (kind of like gripping a pistol), and at the time prior to release -- as the disc starts to slide forward in my hand -- I allow my grip to break down from the conventional two finger grip to a 'claw' grip where my fingers are nearly clenched like a fist on the rim...This creates more torque and a LOT LESS friction as the disc leaves my hand. A low-to-high release point is a problem I see a lot. A good way to correct for this is to slide a disc along a park bench or picnic table to emulate a level and nose-down flight path. Try it! How to focus on your next shot/ or the shot on hand. The disc golf course should be one of the most enjoyable places that we inhabit. Too many times we get caught up in everything else going on in our lives and/or the competitive nature of the moment. In order to consistently make accurate shots I use the following thought processes to help picture, visualize and pull off the remarkable, yet to make the 'expected' shots. I use an internal checklist to help calm my body, my thought processes, and visualization of the finished product--- the disc resting in the basket!!! It all starts with breathing to allow your body clear thoughts. Take a look around at the beauty of your environment that the course has to offer, the trees, hills, lakes, maybe a bird, anything to get your mind 'OFF' of your next shot. There is no reason to 'press' your mind to make the shot before it is your turn---Breathing will oxygenate your body to relieve stress for a clearer mind set. Next up is to visualize the shot and the flight path, picking out a couple of spots/ trees/ ground and picture the angle of the disc at specific points during the flight. Continue the flight path in your visualization, until (where) the disc will come to rest... Satisfy your mind's eye of the gratification of throwing that perfect shot... Think of how good it will feel to accomplish this particular shot.. Don't dwell on that shot because you'll have to do it all over again in a couple minutes, at your next throw... Continued breathing will allow your mind to see your next throw. Good luck and try to see your next shot before it happens!!! Keep it simple. I usually limit my disc selection in my bag to no more than 12 discs. If you break up the game into hyzer shots, straight shots, and turnover shots, how many discs do you really need to carry (that do the same thing)? I like to keep it simple, and keep the same feel of the same edge (of discs) for consistency. Since I throw backhand and sidearm, a hyzer type shot can go either right to left (backhand) or left to right (sidearm), so use the same disc for either shot. Clearwater, FL Clearwater's premier course adjacent to a nature preserve. This is where it all began -- and where champions train today! Largo, FL Pinellas county's hidden gem. It is a pristine county park with slight elevation changes, and some of the nicest amenities of any disc golf course that you will ever see. It has enough trees to keep scores tight in competition. Salt Lake City, UT One of the most scenic backdrops to any course I've ever played. Snow capped mountains nearly year round, and this course has everything from elevation changes, a creek bed area to wooded holes and manicured area of a park setting. Fountain Hills, AZ Can you say The Memorial? Gorgeous surroundings and a huge fountain in the middle. When it kicks on, the wind begins to swirl and things get a bit more tricky--WOW! Brooksville, FL Rarely does a disc golfer have the opportunity to throw in huge elevation changes like this in Florida. This IS extreme golfing at its finest! (172 gm) The Crank is new to my bag. It needs to be thrown hard, and it is very fast. It also holds a nice line into the wind, and I have thrown some monster rollers with it. (172 gm) This my premier hyzer disc for either sidearm OR backhand shots. Great for headwind shots that need to penetrate the wind to carry the needed distance. I also carry an older X plastic version of the Predator for a straighter flight, both are around 172gms. I also use a Pred for forehand roller shots. I love the Predator in all types of plastic but the Big Z version flies faster, and may be more stable. Not only do I use this as a driver , but also when the chips are down and the wind picks up. I use this disc as my "knockdown" disc for any purpose to guarantee an easy par. I fly it out to the side of the pin, knowing it will "check up" and hyzer under the pin. (168 gm) I carry two of these as well. One is a tad "fresher" than the other. I use these for straight shots up hill and downhill. These discs are very easy to control, and because they are light, very easy to "shape" your shots. I can consistently do stand-still sidearm shots up to 340 feet with these discs. (172 gm) This is a very smooth flying disc for long straight hyzer shots. I also use this disc as my main back hand roller disc. This disc just feels good in my hand. (171 gm) I have introduced this disc to my bag for stronger Buzz-type shots. I find this disc can hold a straight line a little better into the wind than the Buzzz, and it gives me a little more hyzer at the end of its flight. (176 gm) This is the best disc ever made!!! 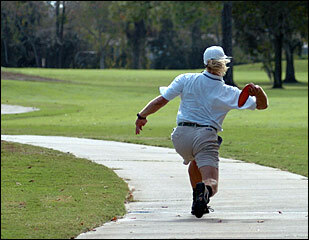 I could play an entire round with just this one disc (and I have), and know I will shoot under par!!! Not just a midrange, this disc flies! Smooth straight, it will do exactly what you want! (176 gm) Meteor is easy to throw straight, and an incredible turn over disc with a ton of glide. Thrown in elevation (changes) this disc is also is a great uphill/ downhill disc. You can get the CryZtal version as a tournament fundraiser: its very similar as the ESP Meteor but it is a little faster and thrown hard, it has a little more carry. (176 gm) Great for turn over shots, or just a smooth straight hyzer shots. My last two aces have been with this disc.This disc has a ton of glide! (175 gm) My putter has always been the 175gm Soft Magnet. Not just a putter it is a great driver as well. I have won many ace funds and post tourney CTP's using the Soft Magnet, I wouldn't use anything else. I always have two in my bag: one a bit aged for driving and long putts, and the other one is fresh for banging the chains.